Okay, actually, they're peonies (which I like more than roses, anyway) but isn't this a nice example of the dress I'm currently obsessed with? Rose let me know about it. I like especially (you can't see it in the teen-einsy picture) that it fastens with side buttons. It's a nice detail, although it means you can't fudge the fit the way you sometimes can with a zipper, or the buttons will pop right off. There's another very similar one in a nice blue-greeny print, too. 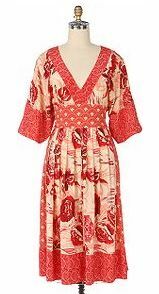 I hate you for making me go want dresses at Anthropologie which I can neither afford nor fit. Never mind “look good in” (because several of them are gorgeous, but would make me look all kinds of weird, or pregnant) BOO! Now I’m starting to worry that this dress will be all over the street this winter and dreary as a leisure suit by Spring. I suppose the right fabric choice dominates the cut. Thanks ROSE for posting the HOTPATTERNS link, I immediately went out and ordered the pattern.I, too, LOVE this dress and drool over the picture which is tacked to my bulletin board.BUT, at a proud SIZE 16, there is no way I could squeeze my gorgeous bod into an Anthropolgie 14.What about making the sleeves wider, so they match the picture? Can I just “cut them bigger? ?” I’m a new sewer and love dramatic dresses. rain: Of course you can make the sleeves wider. You will need a couple of wide strips of tissue paper, a ruler and pencil, and some tape. Just lay the sleeve pattern flat, tape a strip of tissue to each side of the pattern along the seam lines(from the underarm seam to the hem), measure out from the hem 1-3 inches (or more depending on how wide you want the total width–1/2 the total additional width on each side and mark, take your ruler and draw a new seam line from each mark to the underarm seams on each side, connect the new side seams to the existing hem, cut and sew. It should take you about 5 minutes to widen the sleeve.